On Saturday my wife and I went to a graduation party for Cathy Seipp's daughter Maia. Actually the party had a two fold purpose. The first was to celebrate Maia's graduation from high school and admission to UC San Diego. The second was to celebrate Cathy beating the odds in her battle against lung cancer and being able to witness her daughter's graduation. Cathy is one of the bright lights in Los Angeles. She is a Southland conservative who has friends across the political spectrum and sometimes her friends bring interesting guests. 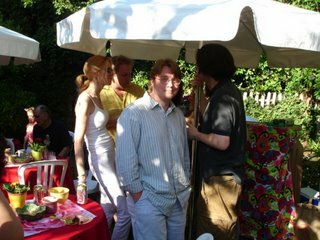 At this particular occasion, you can imagine my befuddlement to be at a party on a sunny afternoon in Los Angeles when who should arrive? Ann Coulter?! Whuh? I was certain, given her pale skin and dread aura, that she was a vampire and incapable of being out during the day. But as it turns out when I shook her hand, after being introduced, I did not gain the expected two negative levels. She was very accessible and had a long discussion with Southland liberal blogger Joseph from Martini Republic. It isn't often one gets to meet a professional provocateur, so I leapt at the chance to see if she was always "on" or if she saved being "in character" for high profile events. As it turns out she had a disarming self-effacing humor. She joked about how her ideal telvision role would be a murder victim on the Fox show 24. She laughed at both how much "liberals" would enjoy seeing her corpse and how much the press would eat it up. LYT described her reception by observing, "It's funny how there are people here who have probably used all kinds of invective to describe her, yet immediately wanted to talk to her." My wife tried to talk me into having my picture taken with her, as did LYT, but I only agreed to have one taken with my back to her pretending to be so cool that I could keep my back turned to one of the most divisive personalities in the modern day. If only Michael Moore had been there too, then my head would have exploded. In case you were wondering, while I didn't gain two negative levels (as expected) I do believe I had to make a Will save, a Fortitude Save, and took somewhere in the realm of 1d8+5 damage. All of which explains the sunglasses Coulter was wearing.